3/8" Gold Round Tag for Hand Stamping $0! 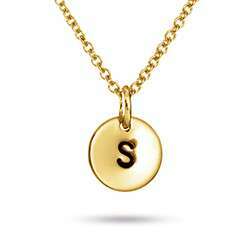 This Hand Stamped Initial Birthstone Gold Necklace is a fun and trendy gift for any friend or family member. You can choose up to six gold plated sterling silver 3/8 inch round tags to be hand stamped with the initials of your choosing. Add a pop of color with up to six 1/4 inch birthstones to represent kids, grandkids or anyone special in your life.